Welcome to Villa florida Belle. Our luxury villa was built in November 2005 on the prestigious Solana Resort in Orlando, Florida. 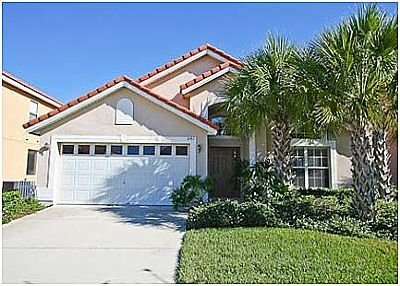 The villa is only 10 minutes from Disney and many other major attractions. We have the added advantage of being at one end of the community, so not only is it peaceful away from the main road, it also has the added benefits of open fields to the rear. Our villa is managed locally by a professional management company that ensures that the pool and property are maintained to a very high standard. Solana is only a 10 minute drive to Disney World. Each night, you can see the fireworks from the pool side of the villa. The coast is within easy reach and only about an hour away. On the Gulf side are the fantastic beaches and attractions like Busch Gardens; on the Atlantic coast is the famous Cocoa Beach and the Kennedy Space Center at Cape Canaveral. Port Canaveral is also home to Caribbean cruises if you are planning a two centre vacation. A little further up the coast is Daytona Beach, home of the famous race track. For general shopping there is a Super Wal*Mart and Publix Supermarket. You may also visit many factory oulets and the superb Florida and Milenia Malls.